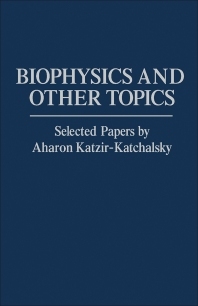 Biophysics and Other Topics: Selected Papers by Aharon Katzir-Katchalsky covers papers on polyelectrolytes, mechanochemistry, irreversible thermodynamics, membrane processes, network thermodynamics, biophysics, and science and humanities. The book discusses on polyelectrolytes, the electrostatic potential, thermodynamic properties, interaction with small molecules and ions, and cooperative transitions. The text also describes mechanochemistry; dynamics of macromolecular interactions; hysteresis; and memory. Irreversible thermodynamics, theory of membrane processes, and network thermodynamics are also considered. The book further tackles the reactions of amino acids with aldoses, polypeptide synthesis, and prebiotic synthesis. The text then encompasses topics on surface activity of polyelectrolytes; properties of the red cell membrane; and science and the humanities. People involved in the study of the above mentioned topics will find the book invaluable.